When you start increasing the load on the electrical system with more powerful headlamps, electric engine fans, accessory chargers etc you expose the major drawback of the standard dynamo which is its inability to provide adequate charge at low rpm. During the fifties there were fewer traffic hold ups and cars had fairly basic energy demands but during the sixties and seventies when cars had more equipment and traffic jams became more frequent, the industry switched over to alternators which gets rid off the poor low speed charging issue. The SP250 finished production in 1964 and whereas a handful of cars (mainly for the police) were supplied with alternators, it never made it into volume production. There are 2 routes open to you. 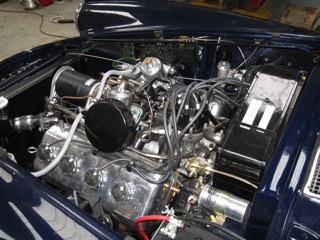 If you are not concerned with maintaining an authentic appearance, we can install an alternator potentially using the mounting bracket off a Daimler V8 Saloon as they were fitted with alternators in the factory. 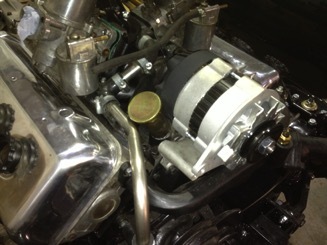 If appearance is important then it is possible to obtain a dynamo whose internals are replaced with an alternator. Either route gets the same result but the latter is more costly. Left is a standard Lucas alternator - right is the dynamo with alternator internals.